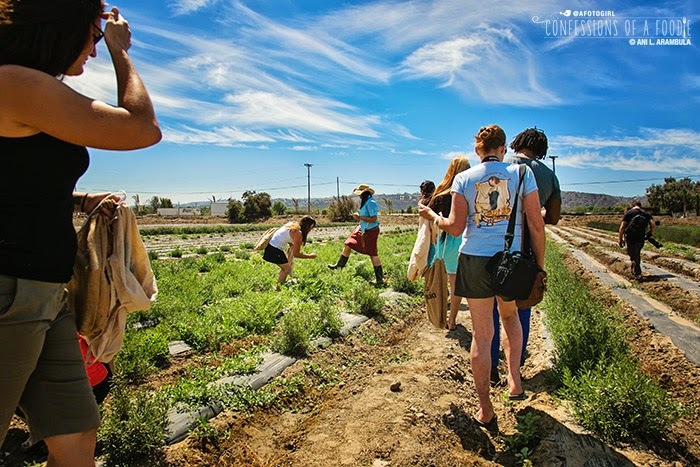 Located in the Tijuana River Valley at Border Fields State Park just 13 miles south of Downtown San Diego, Suzie’s Farm is a 140-acre USDA-certified organic farm. 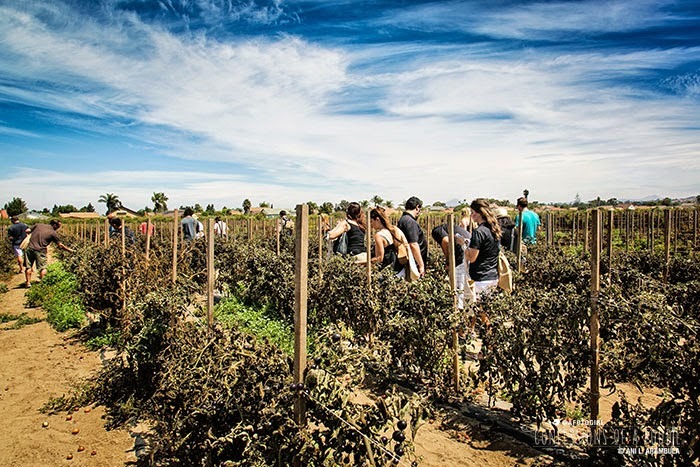 What a beautiful day for a farm tour! 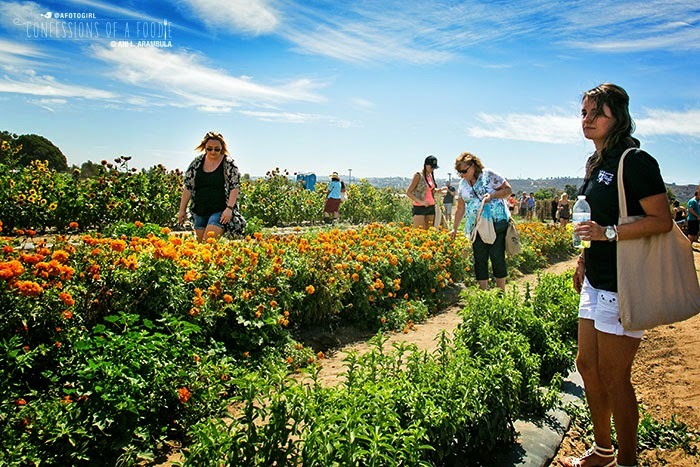 Located in the Tijuana River Valley at Border Fields State Park just 13 miles south of Downtown San Diego, Suzie’s Farm is a 140-acre USDA-certified organic farm. 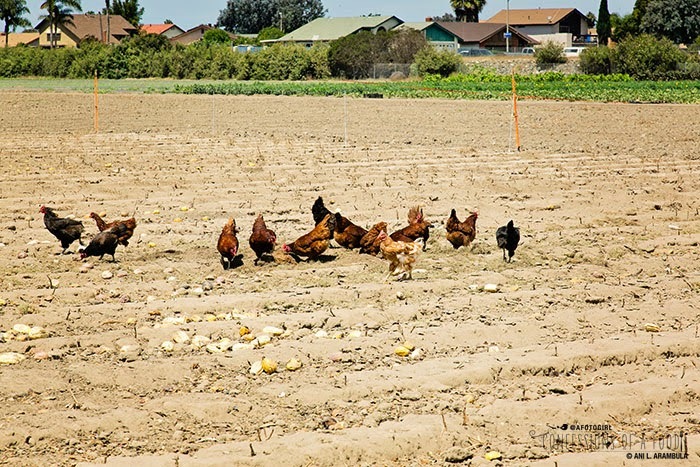 Growing more than 100 varieties of seasonal vegetables, herbs, flowers, and fruits year-round as well as having 300 egg-laying pasture hens, Suzie’s is the only such farm in the City of San Diego. An iPhone shot I uploaded to Instagram of the yummy "morning coffee." It's called a Shakerato. Recipe at the end of this post. 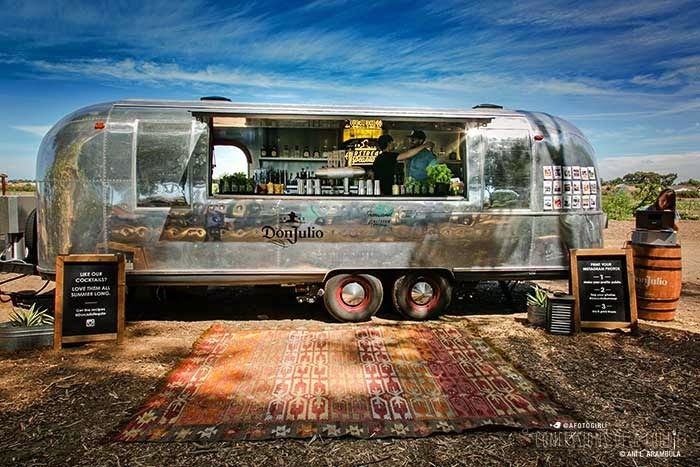 The sweet looking Airstream Speakeasy: a custom mobile bar. You can watch a video about it here. I was one of a small handful of bloggers. The other tour participants were mostly bartenders and distributors. These guys know their cocktails and alcohol! Yowza! Anyway, once we disembarked the tour bus and stepped through the gates at Suzie’s we were greeted by more cocktails and goodie bags. 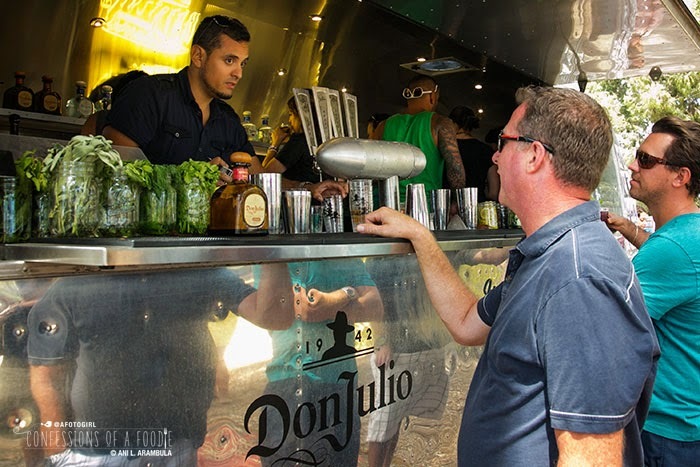 As we milled about the entrance, some folks were checking out the contents of our goodie bags, others were oohing and ahhhhing over the gorgeous Don Julio Airstream Speakeasy, a custom mobile bar. These are grapevine "teepees" that we were encouraged to enter so we might feel what it was like to be enveloped by vegetation. 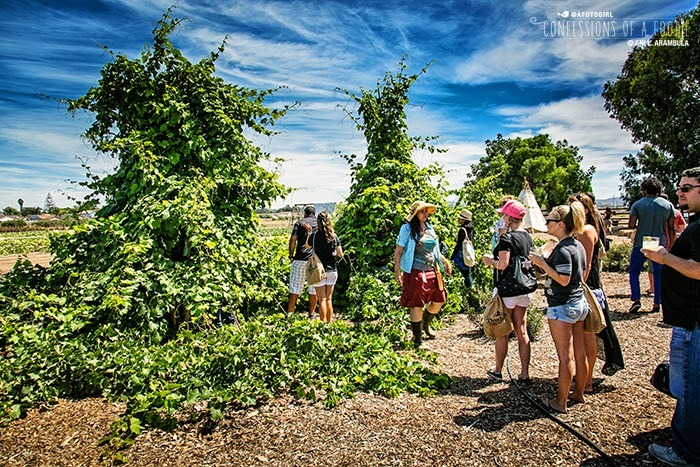 The grapevines were already on the property when the land was purchased and instead of pulling them out, they fashioned them into these fun shapes. Lauren, our tour guide, was super enthusiastic, which was great to see. When people love and believe in the work that they do, their passion shines through, and that positivity rubs off on others around. 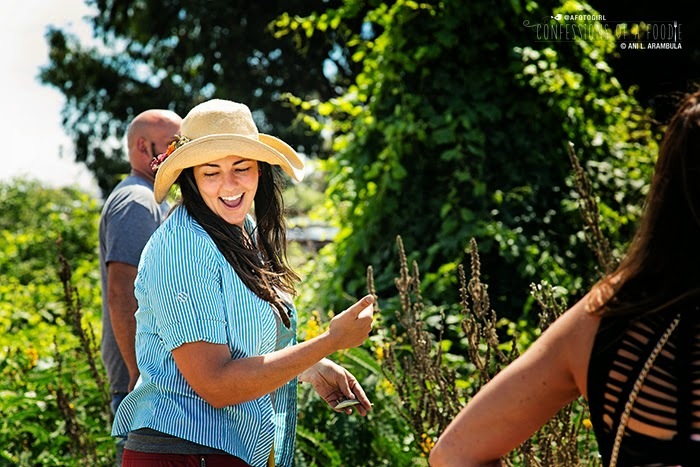 Since the majority of the tour attendees where bartenders, they were encouraged to pick any herbs they wanted to use to create their own cocktails back on the Airstream after lunch. This is a patch of thyme. 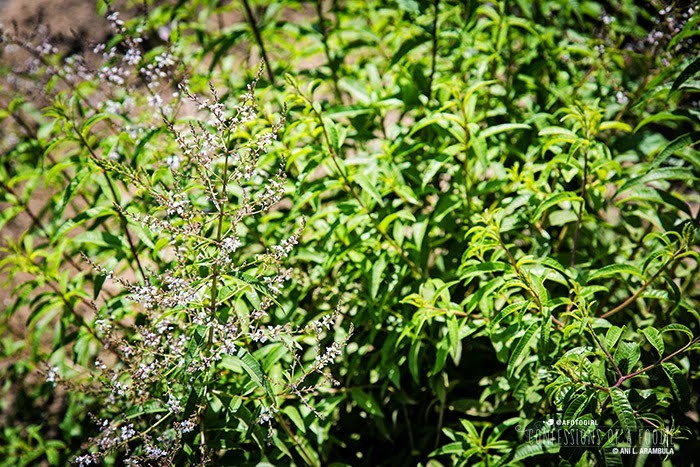 Now we're walking through lemon verbena. Boy! Did it smell fantastic when we brushed by them. 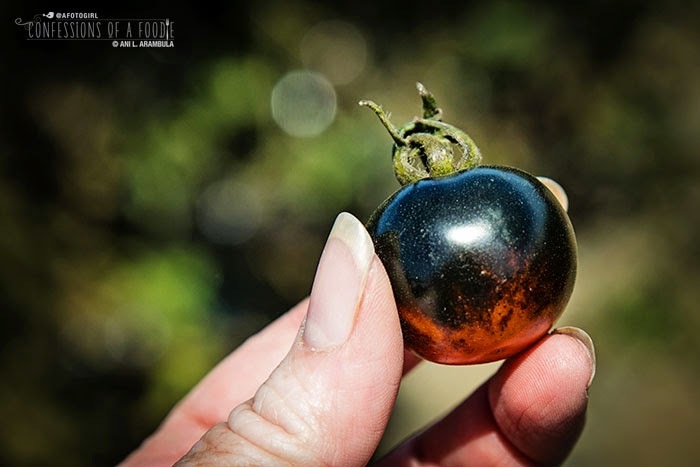 This is called an Indigo Blue Tomato and they go from red to purple almost black as they ripen. They don't get much bigger than this. I'd never heard of them before. They were nearing the end of their growing season and we were encouraged to pick them right off the vine and give them a taste. They were deliciously sweetened by the earth and warmed by the summer sun. Wished I could have taken home a dozen or so! Suzie's grows a lot of flowers along with the vegetables and herbs. 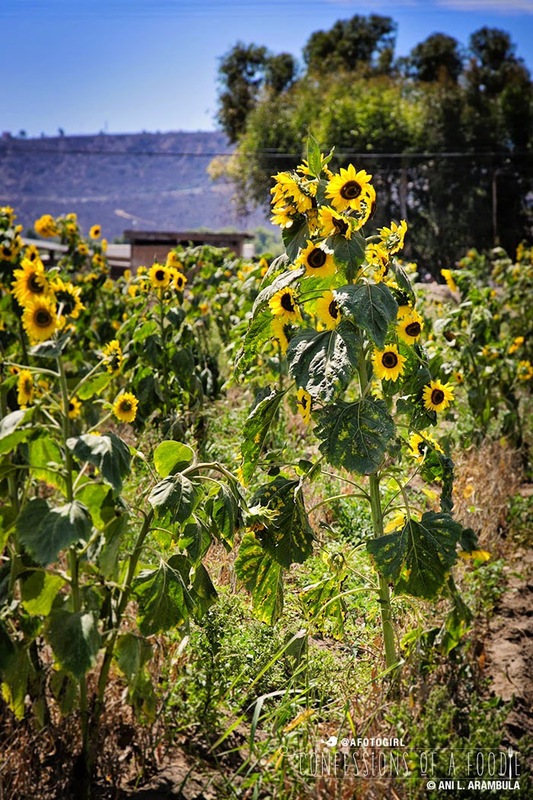 The flowers help bring bees into the fields which in turn helps with pollination. These gorgeous orange and red plants are amaranth. Though billed as a "grain" it's actually a seed, much like quinoa is. It was a staple in the Aztec diet. You can read more about it here. 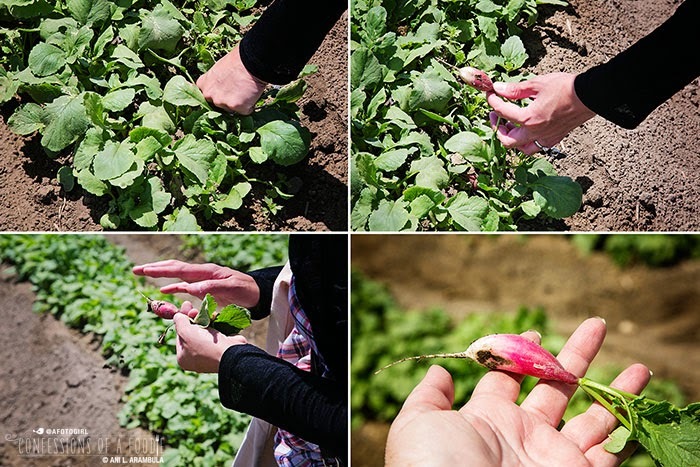 These English Breakfast Radishes (also known as French Breakfast Radishes) were delicious right out of the ground. This is an Armenian cucumber that Lauren is holding up. She passed a few around for each of us to break a piece off and give it a whirl. It was delicious. It's a cross between a seedless cucumber and a melon. Really tasty! I've never heard or seen them before and now I am definitely going to keep my eyes open for them next season. There are 300 hens and chicks in the hen house. No roosters so the eggs aren't fertilized. The chickens, as Lauren described, are free to be chickens, coming and going from the hen house as they please during the day. 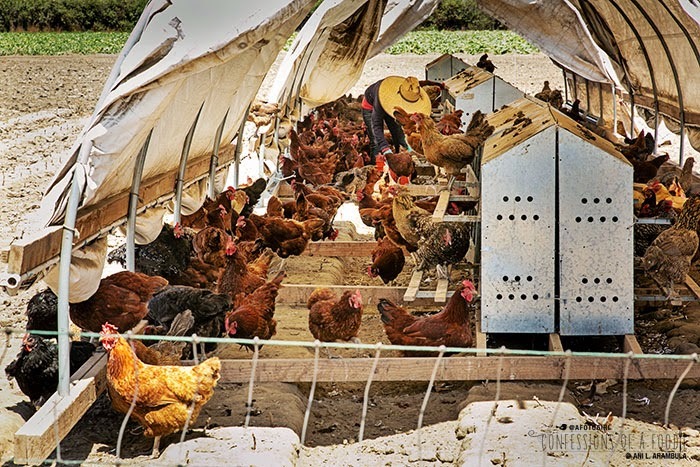 Once a crop is finished, the chickens are moved into the cleared acre, protected by a chicken wire fence, and encouraged to eat the remains of the vegetation and any insects and pests, providing the chickens with a varied diet. The color of the egg shells vary widely as do the colors of the yolks depending on what part of the farm the chickens are allowed to roam and eat from. 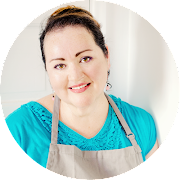 Lauren said that the eggs are more nutrient dense, more naturally good for you since the chickens are clean, not crowded in their hen house, pasture-raised, and free of added hormones. The eggs, apparently, don't even need refrigeration. You do, however, pay for all this humane chicken raising and nutrient dense product: a dozen eggs is $10. I'm planning on buying some soon to give them a taste. By the time we got to lunch, I was famished having only had the donut and cocktail on the bus at the start of the day. 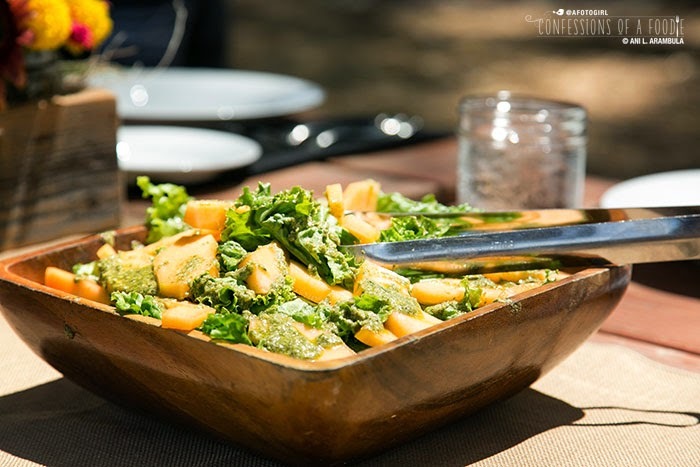 So famished was I that I took only two photos during the meal and both were of salads – made from the gorgeous baby lettuces and herbs grown at the farm, of course! It was delicious meal. During the meal, we got to hear a presentation by the Don Julio folks about Don Julio and his passion and commitment to making a top quality tequila. Shots of tequila were placed at every setting. Personally, I'm not a shots kinda gal. I much prefer my alcohol tempered with other ingredients made into a yummy cocktail. I gave it a sip so that I could say I had tried this top shelf luxury tequila, then I passed it onto my neighbor who thoroughly enjoyed having two shots. After lunch, the bartenders took turns making drinks with the herbs they had picked. I watched in amusement as most of them tried to "one-up" each other. Suzie's is owned by Robin Taylor and his wife, Lucila De Alejandra. 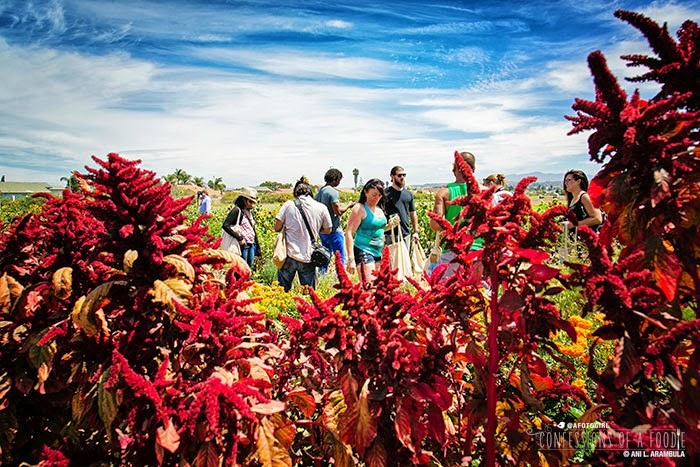 Established in 2004, Robin and Lucila are passionate about feeding the local community and encourage all of their customers to tour the farm and join in on seasonal events. 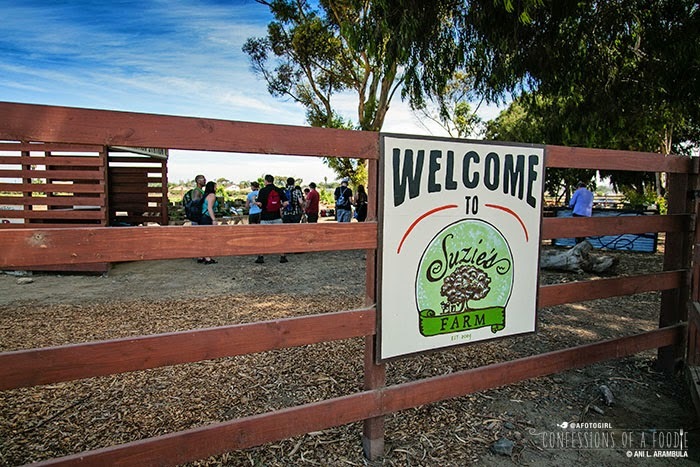 Suzie's acquires the seeds and a team of employees hand plants, hand transplants, and mostly hand harvests everything grown on the the 140-acre farm – no heavy machinery here, just a dedication to being a family run, organic farm. 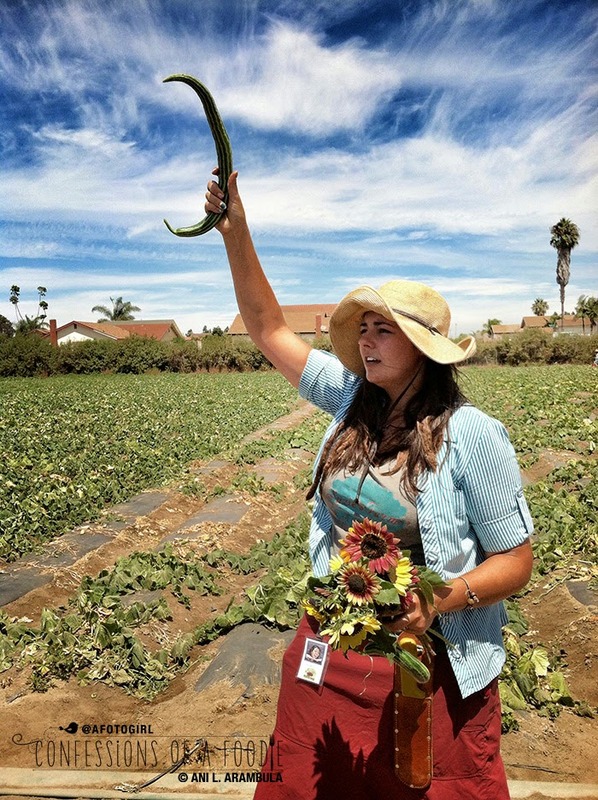 One of the really cool things about having Suzie's "feeding the community" is the fact that once harvested, produce is available next day at market. Some times, it's even harvested and immediately at market the day of. 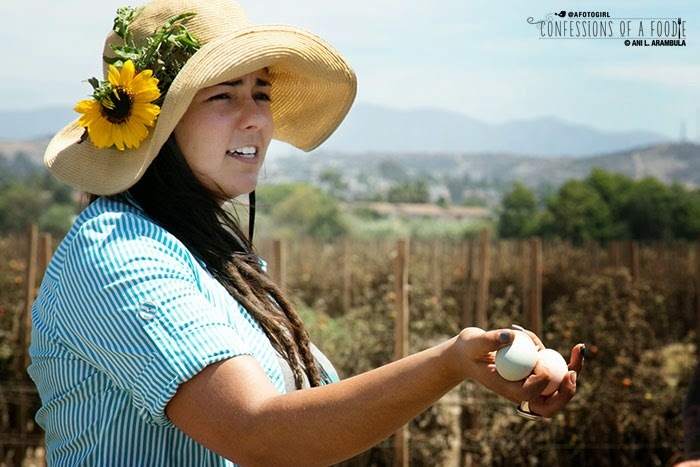 Lucila says, in an interview on UTTV, that while most commercial farmers plant seeds engineered to travel well, disregarding taste, Suzie's Farm plants organic seeds that taste good and don't travel well at all as everything is vine ripened. 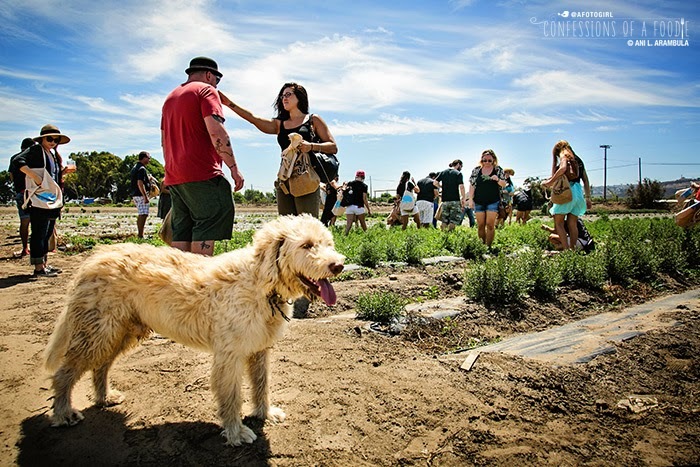 CSA (Community Supported Agriculture) is the cornerstone of their business. Produce subscriptions are available in 6, 13, 26, and 52 box quantities starting at $25 a box for small (6-10 items) and $30 for a large (11-15 items). You can find out more and sign up here. Farm stand open every Saturday from 10:00 a.m. to 2:00 p.m. Additionally, you can find them at a variety of farmers markets around the county and at Whole Foods. See their website for specific farmers markets. 1. Combine Tequila Don Julio Reposado, ancho chili liqueur, cold brew coffee and agave nectar into a cocktail shaker with ice. Shake well. 2. 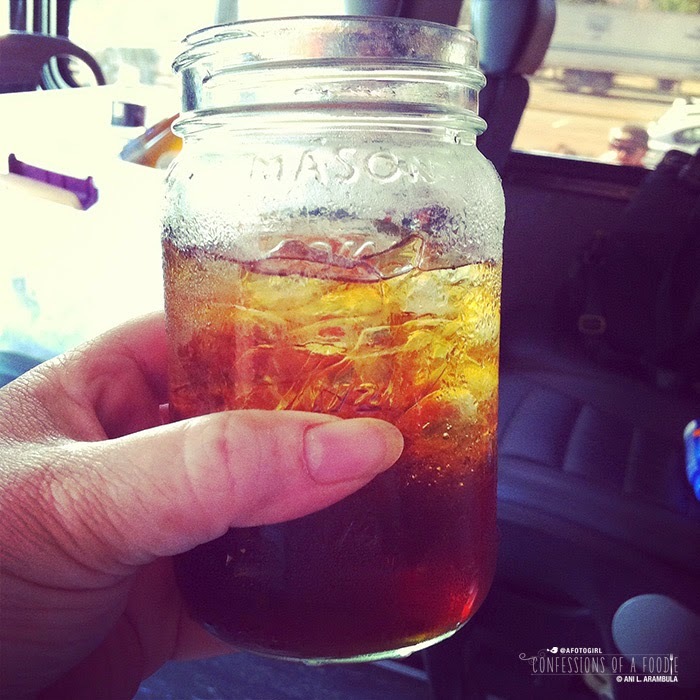 Strain contents into a mason jar over ice. 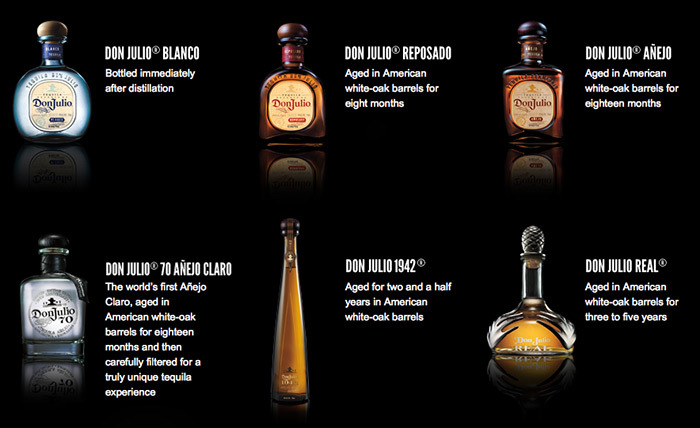 Recipe courtesy of Tequila Don Julio. Reprinted with permission. 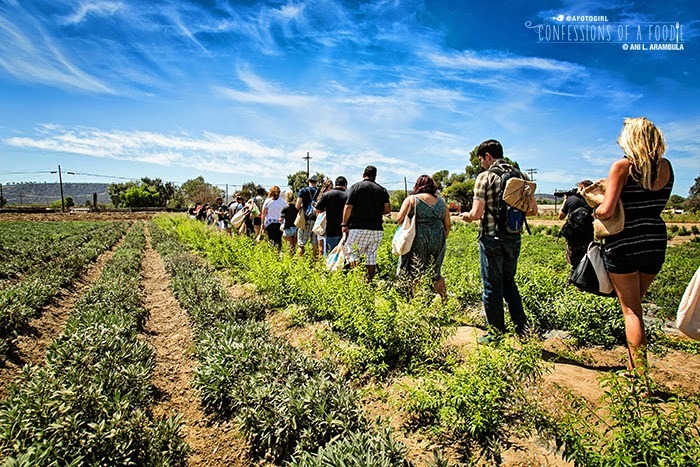 The Farm to Shaker event was sponsored by Don Julio Tequila and Suzie's Farm. I was provided with transportation, cocktail samplings, lunch, fresh herb plants, a cocktail cookbook and a few other random items while participating in this event for editorial consideration. No other compensation was provided. Links within this post are not sponsored and I receive no compensation for click-throughs. I'm providing them for my reader's edification. As always, opinions remain my own.